The March 2017 issue of The Greenwood Tree is now being printed, and will be posted to all members of the Society next week. This is the first under the new schedule, where the publication dates will be at the beginning of March, June, September and December. So if you’ve been wondering where your copy of The Greenwood Tree has got to, don’t despair – it will be with you soon. 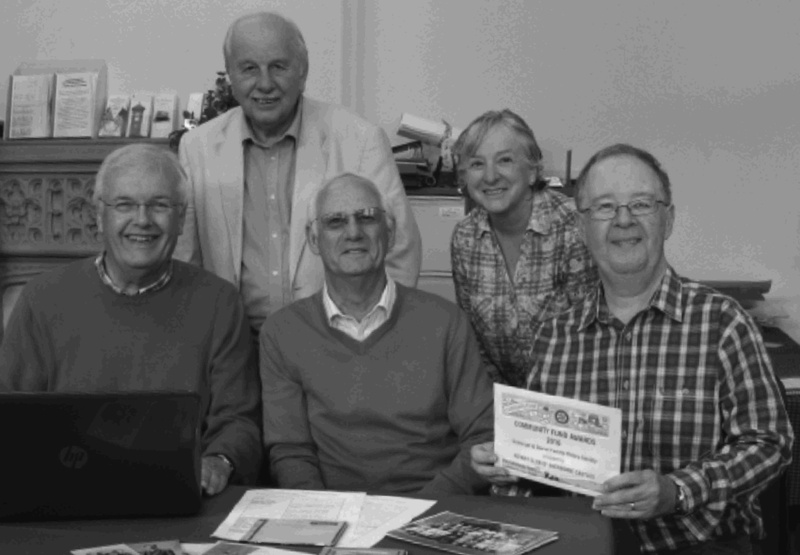 Once the print copies are in the post, the PDF version will be uploaded to the Members’ Area of our website. We have been looking at ways to preserve any colour content in the PDF file, rather than having it converted to black and white, as in the printed version. There is another good reason for viewing The Greenwood Tree on-line, in the Members’ Area: hyperlinks (links to websites or email addresses) can be activated directly, rather than having to be typed in, when is it easy to mistype a long string of characters. 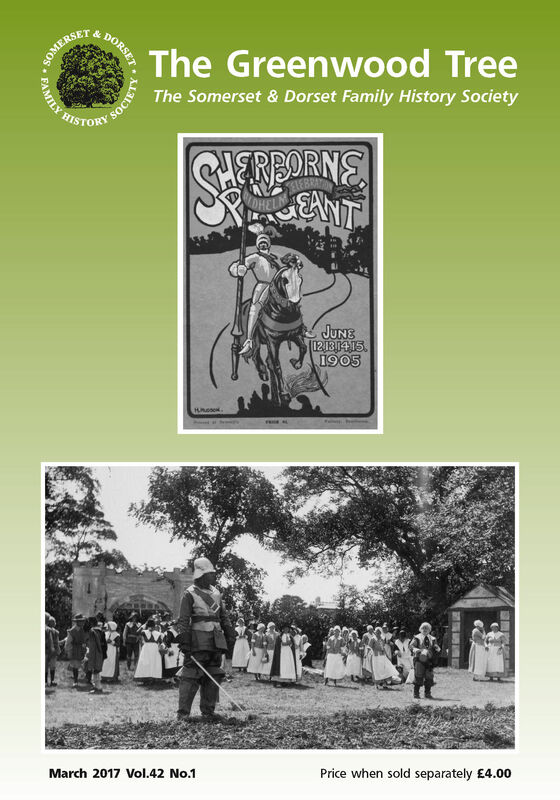 Sherborne’s pageant involved nearly 900 residents from the town and surrounding villages and the Society is researching and documenting as many participants as possible, under the guidance of the Project Co-ordinator Barbara Elsmore. For full details go to the Project’s page on our website. See also page 22 of the March issue, and Barbara’s post on this blog. There were other pageants in our two counties. For example, Dorchester hosted a pageant titled ‘The siege of Corfe Castle’ in 1929 and Sylvia Pitcher describes her researches on page 23. Sylvia’s mother, and her step-mother, took part, and Sylvia has a photograph of one of the scenes which includes them both. Sylvia’s sister still has the costume worn by their mother, Muriel Aylott, in the pageant. From material provided by Peggy Fifield, on page 4 there is the first part of a series of edited extracts from letters sent to England by Annie Blanche Trew, a nurse who served in the Army Nursing Service Reserve in South Africa during the second Anglo-Boer War. The letters were written in late 1900 from Bothaville, a small town in the very north of the Orange River Colony which was still under Boer control at the time. The letters are a fascinating insight into the struggle to keep going under very difficult circumstances and the mutual animosity between the British and the Boers is very evident. 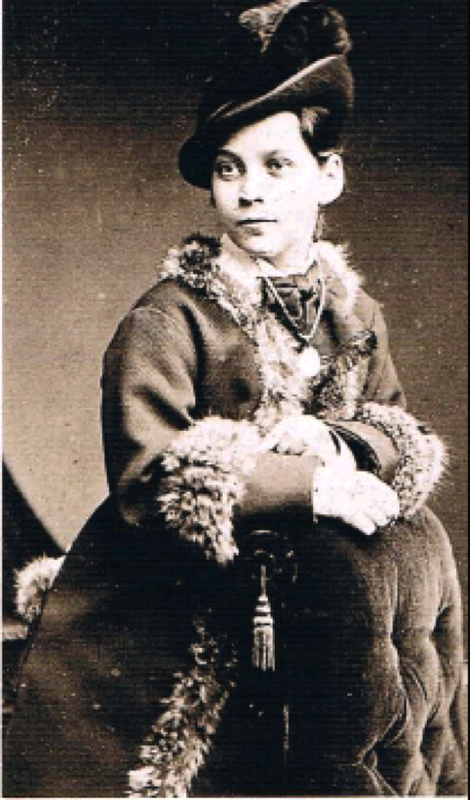 Annie was awarded the Royal Red Cross medal for her service during the Boer War. 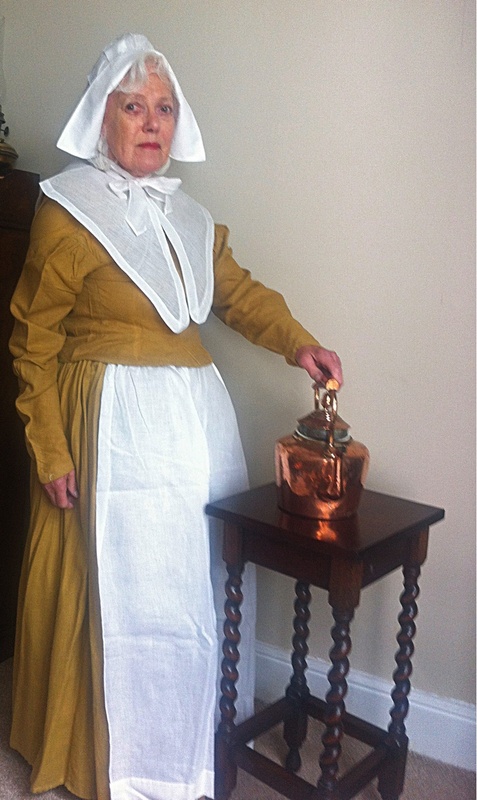 Clare Reeves has sent us a diary/log compiled by her 2x great-uncle, William Haviland Handover. William was born in 1858 and raised in Ilchester in Somerset, but sailed on the Duke of Buccleuch on 31 December 1884, bound for Australia. He kept a log every day of the ship’s progress, including the number of miles sailed. He reached Brisbane, Queensland, on 5 March 1885, a journey of 64 days. Diane Brooke continues to find interesting documents on eBay. Among them is a mortgage from 1760 which includes the signature of Rev Samuel Woodforde, the father of the famous diarist, James Woodforde. Another interesting document was shown to me by Iain Swinnerton, our Society military expert and a volunteer at the Family History Centre in Sherborne. The document, for the parish of Bathford near Bath in Somerset, dates from 1804; with the threat of invasion during the period of the Napoleonic Wars each county was required to organise itself into divisions to coordinate and document resources and establish a system of communication. Of particular interest are the lists of names, essentially a census of the adult males in the parish at the time, as well as a list of the quantities of livestock and dead stock in the parish. The names have been transcribed in the hope they may be of interest to those with ancestry in the area. We hope you enjoy reading this edition. There are clearly still lots of things happening in the world of family history. Good luck with your researches in 2017. 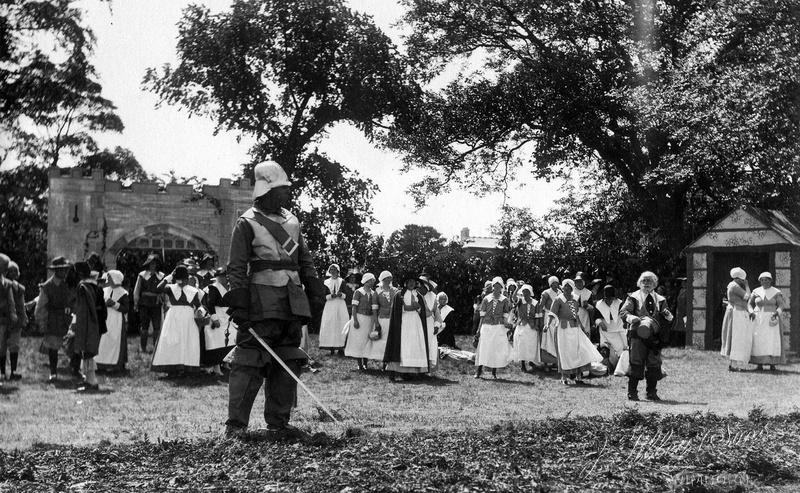 This entry was posted in Uncategorized and tagged Anglo-Boer War, Annie Blanche Trew, Arts and Humanities Research Council, Barbara Elsmore, Bath, Bathford Parish, Dorchester, Dorset, Duke of Buccleigh, Historical Pageants, Ilchester, James Woodforde, Rev Samuel Woodforde, Rotary Club of Sherborne Castles, SDFHS, Sherborne, Sherborne Pageant, Siege of Corfe Castle, Somerset, The Greenwood Tree, The Redress of the Past, William Haviland Handover. Bookmark the permalink.